RAWALPINDI: Chief of the Army Staff (COAS) General Raheel Sharif on Tuesday said the on-going war against extremism and terrorism cannot bring enduring peace and stability in the country unless the menace of corruption is uprooted, stressing the need for across the board accountability to secure a better future for generations to come. According to a statement issued by the Inter-Services Public Relations (ISPR), the media wing of the army, General Sharif was addressing officers, men and families of Shuhada during his visit to military’s Signal Regimental Centre in Kohat, Khyber Pakhtunkhwa. 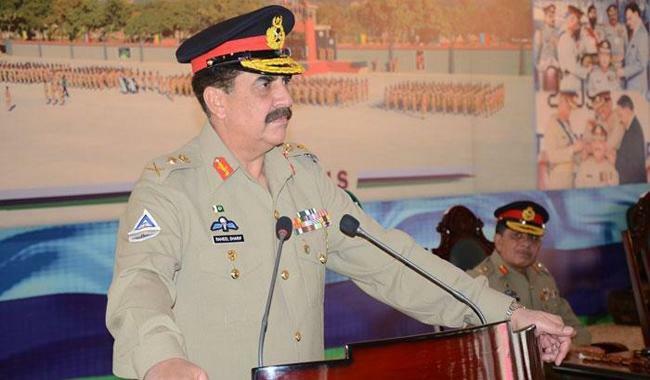 “On-going war against terrorism and extremism being fought with the backing of entire nation cannot bring enduring peace and stability unless the menace of corruption is not uprooted,” he said, adding that the military would fully support every meaningful effort in that direction, which he said would ensure a better future for next generations. “Across the board accountability is necessary for the solidarity, integrity and prosperity of Pakistan,” the ISPR statement quoted the army chief as saying. According to the ISPR, the army chief attended an installation ceremony during which he pinned the badges of rank on the shoulders of Major General Sohail Ahmed Zaidi to formally install him Colonel Commandant of Corps of Signal. The COAS appreciated the sacrifices rendered both by men in uniform and civilians alike in defeating the terrorists and dislodging them from their bases. General Raheel Sharif applauded the extra ordinary efforts of ranks of signals corps in providing communications support to Operation Zarb-e-Azb.